Fugelsang, host of SiriusXM’s Tell Me Everything, will be joining a research team launched by Nekton, a UK-based scientific research charity formed by scientists from a dozen marine research institutes, to help raise awareness of the health and resilience of Earth’s least-explored and largest ecosystem. 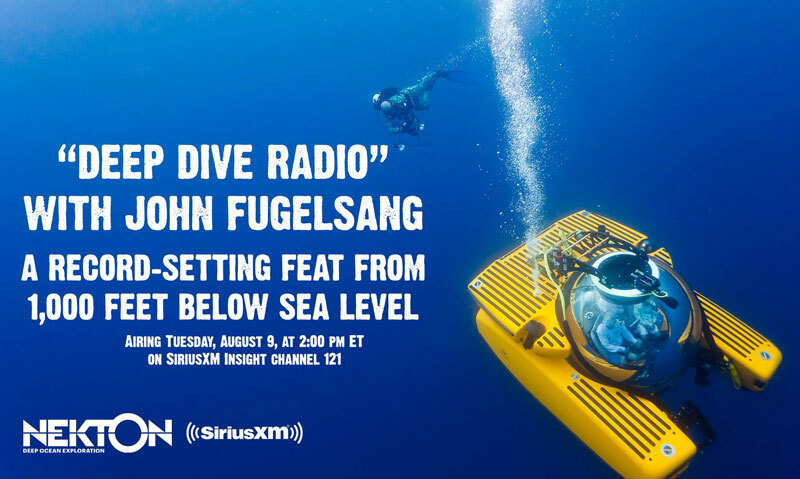 “Deep Dive Radio” will air live on Tuesday, August 9, at 2:00 pm ET on SiriusXM Insight channel 121. The show will also be available on SiriusXM On Demand for subscribers listening via smartphones and other connected devices or online atwww.siriusxm.com. It will replay August 9 at 4:00 pm; Wednesday, August 10 at 3:00 pm; and Thursday, August 11 at 4:00 pm. All times are ET. “We are pleased to partner with Nekton for ‘Deep Dive Radio’ and help raise awareness about our oceans in a fun and unique way,” said Dave Gorab, Vice President and General Manager of Talk Programming, SiriusXM. Oliver Steeds, Nekton’s Mission Director and Founder, will be piloting the submersible and joining Fugelsang during the special SiriusXM broadcast to discuss the current state of the oceans and its effects on land, and to take calls. Callers expected to participate in the record-setting broadcast will include Mark Hamill, David Crosby, James Cameron,Lewis Black, and Rod Roddenberry. In addition, world renowned ocean scientists and conservationists Celine Cousteau, David Gruber, Patrick Lahey, Nainoa Thompson, and Joe McInnis – the Father of the Oceans – will also be joining in the conversation. Fugelsang and Steeds will also take a few scenes from some of the most popular ocean-themed movies – including Jaws, The Little Mermaid, and Finding Nemo – and act them out under the sea.